Lunchtime is the best time! ... and the Master bath! I am loving the fresh colors and can't wait for the painters to come this weekend and paint the dining room and kitchen. Saturday the kids and I ran a few errands and then enjoyed a picnic on the porch while we waited for Mrs.Anderson to come pick up boxes from us. Mason ate almost that entire pint of blueberries! He thinks they're candy. After lunch we colored with chalk and had ice cream sandwiches! Even Jack got in on the swimming action! And these three looked so cute in their red, white and blue! Sunday night my dad came over to stay with Griffin and my mom and I took the boys to the VIP Party at the Smiles Charity concert. (If Dave had been MIA during this post it's because it was a CRAZY weekend for him at work and he worked a TON). ... and live music (we were there early and heard the opener... some guy from American Idol). As the event filled up, the sky got darker and we actually saw lightning and decided to head out. It was great timing for us to leave because about 10 minutes later a HUGE storm rolled through and they ended up sending everyone at the event to the parking garage to wait it out. I was going to share about Monday as well, BUT my phone is being weird and I can't get the pictures off of it (AND it's late) so I"ll share those another day. Dave is off today (hallelujah!) and we have plans to hang out at the pool and get things done around the house. Is Griffin into The Little Mermaid?? I'm sure she's loving that suit if she is! It's adorable! She hasn't watched it yet BUT I have it on DVD and just pulled it out for her to watch today! That was my first Disney movie and I'm hoping she LOVES it! What a great weekend! I'm so lovin' your new house! It already looks like home!!! What a fun weekend! And Griffin bathing suit... too cute! The house is looking great Andrea! It looks like you had an awesome weekend!! Love those pics of your kiddos swimming! Have a great day, friend!! Mason's shoes always crack me up! Griffin's suit is the cutest! Too bad they don't make that in adult sizes haha! I think some little girl swimsuits would look great on adults, too! Enjoy your pool day! So when you say you bought her the suit you actually mean you got it for free and then make commission when people buy it? Nope. I meant that I actually bought it. As in, ordered it off the website when it came out. I'm friends with the girl who owns Sew Chill and occasionally she'll send Griffin pieces to promote, but I disclose that in the body of the post or at the end. And no, I don't make any commission off of her links - most of the small shops I work with don't pay commissions. 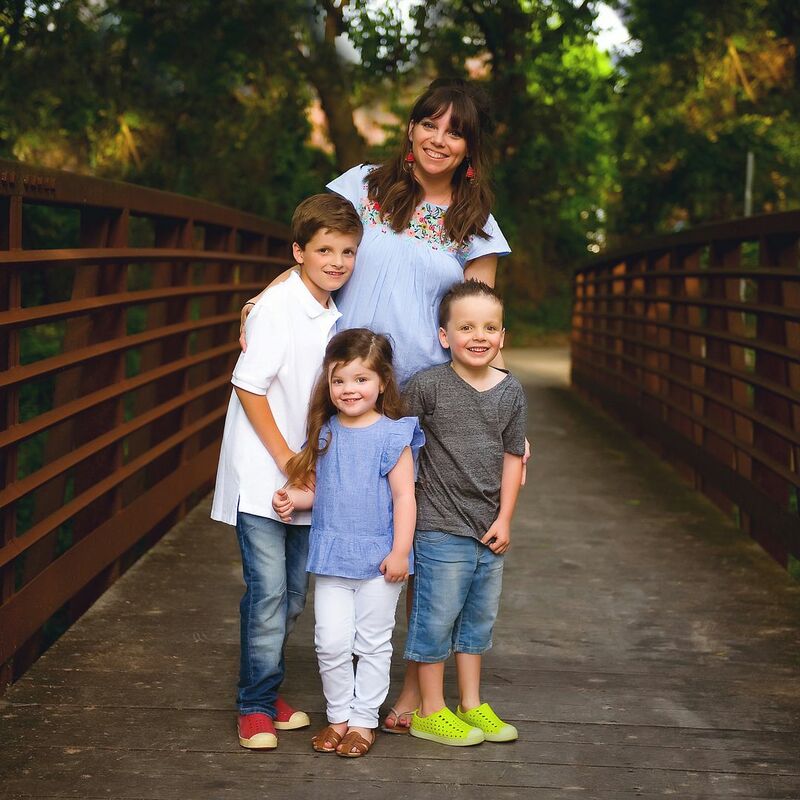 We enjoy the products and love spreading the word for businesses run by hard-working moms! Feel free to email me if you have any other questions about my disclosures and/or when we receive something c/o. When my boys were younger they could spend HOURS rolling down a grassy hill. So much fun! Simple fun is the best fun! Simple fun is by far the best! Treasure those messy, dirty grass filled kiddos...all too quickly they grow up and don't want to play like that! Hope you guys have an awesome summer! And the house...it's beautiful. Congrats !!! I cannot wait to see your house? Seriously. When is that going to happen? It looks so great already!!!! Ummm... today! hahaha Seriously! Stop by! As soon as I get my cabinets back on I'll have to have everyone over. That little suit is adorable! Loving the colors you picked for your house! GG is adorable in that plaid dress!!! Thank you! I'm a sucker for red, white and blue plaid! And thank you for the heads up on the typo! Fixed it! Where is that adorable dress from? I love it! Ah! Can you please fill me in on where you got the sitting chair in the corner of your living room? I need that chair! haha! Thanks so much! I got it at HomeGoods a while ago. I realize how not helpful that is - SORRY!!! I'll look later today and see if I can find a brand label on it anywhere. Griffin looks so old in some of these pictures! almost pre-teen! but then there's the photo of her back by the pool and she's all tiny again! such a sweet costume! 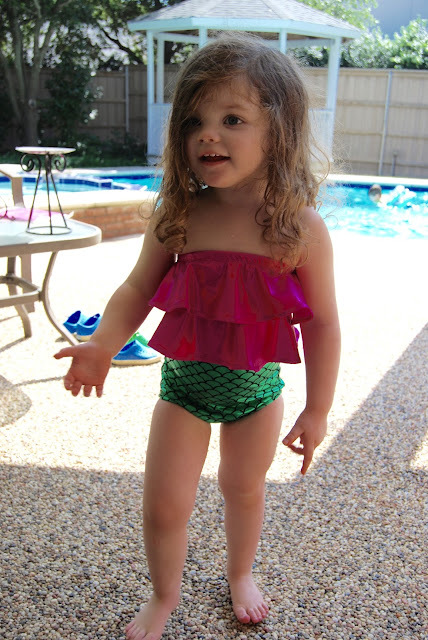 Oh my word, that mermaid bathing suit is darling! Who comes up with this stuff?! So sweet! Can you tell us what color the paint is in Mason's room? Andrea your house is gorgeous inside and out. I really love it. I bet you are enjoying this process of decorating and stuff. What is the name and brand of the paint color in your family room?!?! Obsessed. That Sweet Tea sign is adorable! I love your new home!